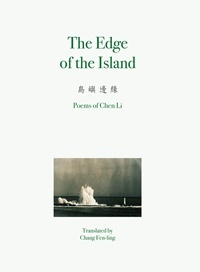 One of the foremostpractitioners of contemporary Chinese poetry in Taiwan, Chen Li has translated,with his wife Chang Fen-ling, the works of many poets—such as Plath, Heaney,Neruda, Paz, Tranströmer, Szymborska, Yosano Akiko—into Chinese. He subtlycombines in his poetry the elements of Western modernism and post-modernismwith the merits of Oriental poetics and the Chinese language, seekingincessantly to find a balance between art and life, suffering and joy, dreamand reality. In 2012, he was invited to the Olympic poetry festival (PoetryParnassus) in London as the poet representing Taiwan. Chen Li (born in 1954) is one ofthe foremost practitioners of contemporary Chinese poetry in Taiwan. He startedwriting poetry in the early 1970s and has published thirteen collections. In awriting career spanning more than forty years, his poetic style has undergoneseveral transformations. Originality, variety, wittiness, and profundity havealways been his signal traits; fluent command of imagery and innovativetechnical experimentation are characteristic of his works.